This book is in two parts, one covering modern day Orléans, and the other, the history of Joan of Arc. In the current day novel Ines Picaut is caught between having to discover who is lighting fires in the town and her relationship with her husband. She realizes she is just a pawn in his political ambitions. What she doesn’t realize is just how much she is being played. The historical novel proposes a truth to whom the woman known as Joan of Arc really was. There is a secret hidden within a body, burning within the flames, that will change history forever. 2014: In the French city of Orleans, a man’s charred corpse is found in a burned-out hotel, stripped of all ID. Police captain Ines Picaut must hunt down his killer before others fall prey to the fire. She has only one clue: the name of a woman who has been dead for over five hundred years. 1429: Joan of Arc is taking the war to the English. They want her dead but the only way to reach her is through a fiercely loyal inner circle – until undercover spy Tomas Rustbeard finally earns her trust…The myths of the past hold the key to the mystery of the present, but how many must die before the truth is laid bare? I got the sensation that two different people had written this book. 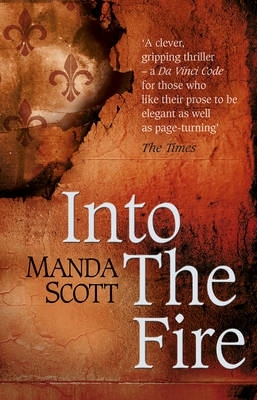 Manda Scott is a great story teller and perhaps the book would have been better split in two. One dealing with history and the other with the modern novel. I must say I preferred the historical novel way more as I learnt something new. And it made me think. I would suggest you read this book if you are a fan of Joan of Arc. Wishing you all the most amazing 2017! Dave and I are on leave. We will be back at work on the 9th of January. I will start replying to comments then. I wish you all the best over the festive season. This book sounds good to me. Love your review. Great review Tandy, will have to check out this book, I love historical info. I remember seeing the Joan of Arc film and being amazed by the extraordinary story. Interesting about the book seeming written by two people! I must look out for the movie!